DARPA's Proposed Phoenix satellite tender nears a satellite in orbit. An ambitious Pentagon effort to repair and recycle satellites in Earth orbit has moved one step closer to reality. The Defense Advanced Research Projects Agency (DARPA) awarded prime contracts to eight companies earlier this month, advancing its Phoenix satellite-servicing program to Phase 2 of development. 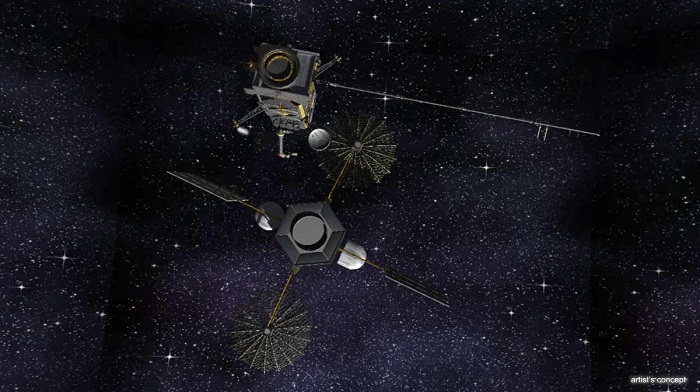 "Phase 1 not only showed the feasibility of our robotic tools and assembly techniques, but also validated the concept that we could build new satellites on orbit by physically aggregating satlets in space," DARPA program manager David Barnhart said in a statement. "These successes could eventually lead to the revolutionary ability to create new, truly scalable space systems on orbit at a fraction of current costs." DARPA hopes Phoenix develops tools and capabilities that will allow satellites to be inspected, serviced, upgraded and assembled on orbit, extending the lifespan of existing space assets and significantly reducing the cost of future satellites. These goals apply especially to hardware in geosynchronous Earth orbit (GEO), which lies about 22,000 miles (35,406 kilometers) above the planet's surface. Satellites way up there are pretty much out of reach with current technology, officials said. Researchers will concentrate on three main areas during Phoenix's Phase 2. First, they'll continue to develop advanced space robotics technologies that would allow a future "Servicer/Tender" spacecraft to assemble, repair and refuel satellites in GEO. Engineers will also work on developing "satlet" architecture — a system of many small, independent modules that can be joined up in various ways to accomplish a broad range of mission objectives. The 15-lb. (7 kilograms) modules could be produced on an assembly line and outfitted with different payloads easily and quickly, DARPA officials said. Phase 2 will also advance research into a cost-cutting Payload Orbital Delivery (POD) system, which would allow a variety of payloads, satlets and other gear to hitch rides to space aboard commercial communications satellites. "Individually or together, these technologies could help enable not just Phoenix’s original concept of re-use, but a broad class of other robotically enabled missions at GEO as well," Barnhart said. "They could help satellites reach new or proper orbits, inspect satellites as part of routine maintenance or troubleshooting efforts, repair or replace worn-out components or add or upgrade capabilities." The eight companies receiving Phase 2 prime contracts are Busek; Energid Inc.; Honeybee Robotics; MacDonald, Dettwiler and Associates Ltd.-Canada; MacDonald, Dettwiler and Associates Ltd.-U.S.; NovaWurks; Oceaneering Inc.; and Space Systems/Loral.